Is there a better feeling as an artist than when you find yourself lost inside the world of your painting as it unfolds in front of you? Everything seems to be happening as it should, but it’s as if you are not even painting it! Yet somehow the thing appears – as if by magic. Of course when this happens (and it does not always!) it is not magic; but it does feel magical. And it is at those times when I feel most alive – when I exist completely in the moment of creation – no worries about the past and no fear of the future. All that matters is what is happening at that very moment in the world of the painting. Then I feel beyond time and space – outside myself, and completely at peace. I am untouchable. My choices and reactions are the ones that have come from somewhere beyond thought and effort. Rather they spring from something more direct and honest, more emotive and pure. I’m always asking my groups – and myself – “not to paint whatever it is that inspires us – but rather to try to paint the inspiration itself”. Fancy words, but what do they mean? Well, for me, if I am stopped in my tracks by a particular sight or scene and suddenly “feel a painting coming on”, I think it’s important to remember that the painting I will do will not be a copy of whatever that sight or scene is – but rather my interpretation, my reaction, to that sight or scene. Because if there is any art to be found, it is only there. And so with little more than my basic idea and an overall plan of shapes and values in mind, I begin. And this is where my thinking stops and my feeling takes over. I then just have to trust myself enough to let my instincts lead the way. And as I paint, I am informed – and my painting is shaped – by my emotional response to the scene that inspired me – not by the specifics of the actual scene itself. In fact, once the painting begins, the actual scene fades in importance as it is in the world of my painting that I now live entirely. Given this, I am very open to the possibility that my plan may – and will – shift as I proceed….. All paintings have a mind of their own. So its great to be able to let “mistakes” happen and decide on the fly if they are good or not. Most often, when they happen (and they will), you learn to recognize immediately that they are often “just what the painting wanted” and you see them not as mistakes, but as advantages that could have never been planned. Memory and instinct silently guide us to make choices our mind could never imagine. Learning to shut off the world, turn down the volume in your mind, and “listen to your painting” is really just another way of saying that you are learning to trust yourself and hear only your own unique artist’s voice at last. That – and your painting – very often know what is best. 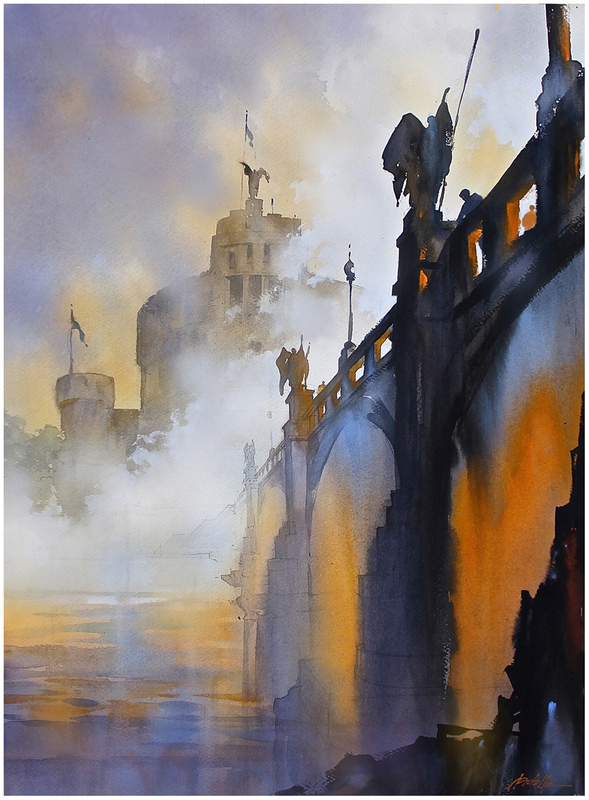 My watercolor painting “Fog on the Tiber – Rome” from last year is of real things in a real place – but is much more about how I felt and reacted to those things – that place – on that day. Thank you Tom for such a wonderful piece. That sense of total immersion and your emotional connection with the scene you are creating is inspiring and something to which I aspire. Thank you so much Roy – Much appreciated.